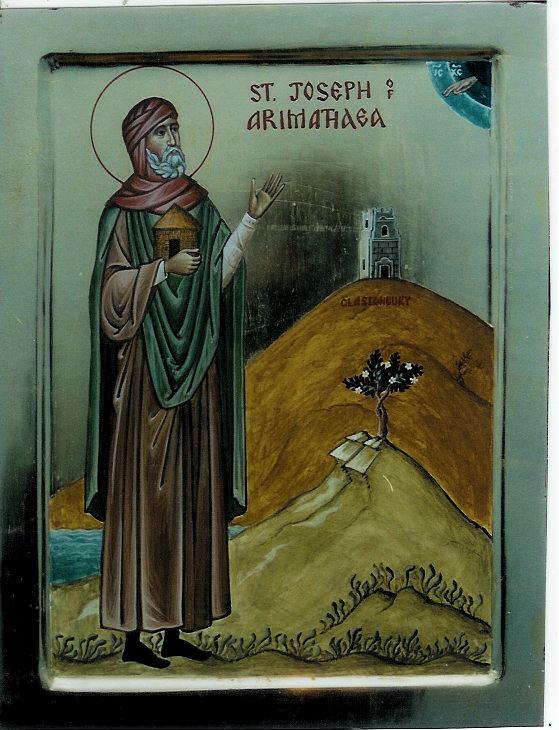 Saint Joseph of Arimathea was accounted worthy to bury the immaculate body of our True God, Jesus Christ and, after the Lord's glorious ascension into heaven, preached the Holy Gospel in many diverse lands. Of St. Joseph's early years little is known except that he was the son of wealthy and noble parents of the Old Covenant. This pious family lived in the city of Ramah or Arimathea. As a youth Joseph was taught the sacred scriptures and knew well of what should come to pass when the Saviour and Redeemer would come into the world as foretold by the Holy Prophets. As the God-loving Joseph grew, inspired by the Holy Spirit, he pondered on the prophecies. He considered the prophecy of the Holy Isaiah : The Lord Himself shall give you a sign; Behold a virgin shall conceive and bear a son and shall call His name Immanuel. (Is.7:14). And the prophecy of Micah, But you, Bethlehem, House of Ephratha, are little among the thousands of Judah, yet from you shall come forth to me Him who is to be ruler in Israel, and His going forth is from the beginning, from the days of eternity. (Mic.5:2). And, behold, there was a man named Joseph, a counselor; and he was a good man, and a just: (The same had not consented to the counsel and deed of them;) he was of Arimathaea, a city of the Jews: who also himself waited for the kingdom of God. (Luke 23:50-51) He had the position of an honourable and respected member of the Jewish Privy Council. It was then that He Who is from eternity came unto the people of Israel performing miracles, teaching, and proclaiming the New Covenant between Himself and those who would follow Him. As the Gospel of our Lord came unto the people of Israel, Joseph wondered, Could this Jesus of Nazareth be the One foretold, the Redeemer of Israel? And as Joseph beheld Christ and His disciples and the multitudes of followers, he recalled the words of Isaiah: The people that walked in darkness have seen a great light: they that dwell in the land of the shadow of death, upon them hath the light shined. For unto us a child is born, unto us a son is given: and the government shall be upon his shoulder and His name shall be called Wonderful, Counselor, The mighty God, The everlasting Father, The Prince of Peace. (Is.9:2-5). It was then that Joseph became a disciple of the Lord, but in secret for fear of the Jews. (John 19:38). But soon, He through Whom all things were created was betrayed and of His own Will gave Himself up for the life of the world: And they crucified Him, and parted His garments, casting lots....And it was about the sixth hour and there was a darkness over all the earth until the ninth hour. And the sun was darkened, and the veil of the Temple was rent in the midst. And when Jesus had cried with a loud voice, He said, Father, unto Thy hands I commend my spirit: and having said thus, He gave up the ghost. (Luke 23:44-46). “When even was come, there came a rich man of Arimathea named Joseph, and went boldly unto Pilate and begged from him the body of Jesus. A mortal went in before a mortal, asking to receive God; the God of mortals he begs; clay stands before clay so as to receive the Fashioner of all! Grass asks to receive from grass the Heavenly Fire; the miserable drop seeks to receive from a drop the whole Abyss! Who ever saw, who ever heard such a thing? A man grants to a man the Creator of men; a lawless man undertakes to surrender the Definition of he Law of lawless men; a judge deprived of judgment permits the burial of the Judge of judges Who has been judged to death. When even was come, he says, there came a rich man named Joseph. Truly was this man rich who carried away the entire compound hypostasis of the Lord. Verily was he rich, because he received the twofold nature of Christ from Pilate. He was rich indeed, because he was accounted worthy to carry off the priceless Pearl. Truly was he rich, for he bore away the Pouch overflowing with the treasure of Divinity. And how would that man not be rich who acquired the Life and salvation of the world? How should Joseph not be rich, who received a gift Him that sustains and rules all things? When even was come for the Sun of Righteousness had then set into Hades. Wherefore there came a rich man named Joseph of Arimathea, who was a secret disciple for fear of the Jews. And there came also Nicodemus, which at first came to Jesus by night. O hidden mystery of mysteries! 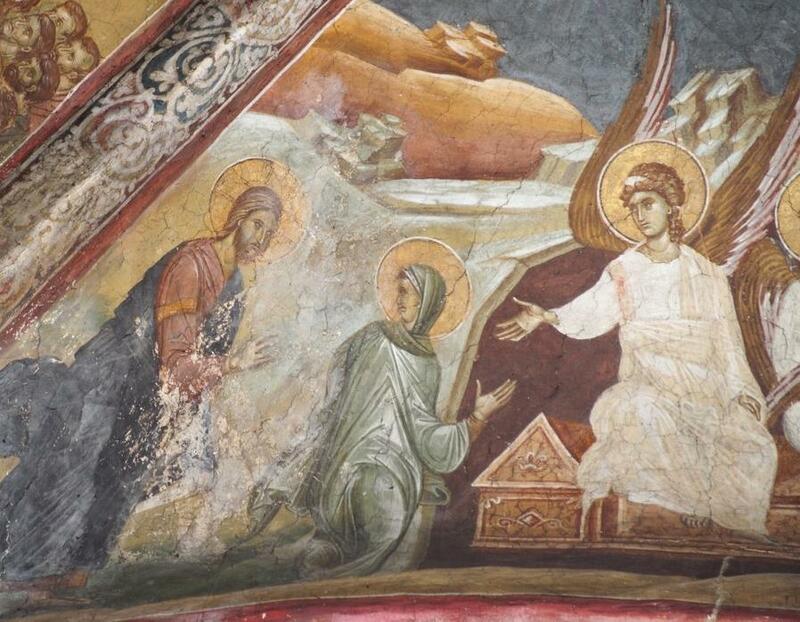 Two secret disciples came to conceal Jesus in a tomb, thus teaching by His concealment the mystery concealed in Hades of the God concealed in the flesh. Each one of these men surpassed the other in their affection for Christ. For Nicodemus proved his magnanimity by the myrrh and aloes, and Joseph proved worthy of praise by his daring and boldness before Pilate. For he, casting off all fear, went in unto Pilate and begged the body of Jesus. Now when he went in he acted very shrewdly so as to obtain his longed-for aim. Wherefore, he did not employ high-sounding and pompous words lest Pilate be moved to wrath and he fail in his request. Nor did he say to him, ‘Give me the body of Jesus, Who but a short time ago darkened the sun, split the rocks asunder, shook the earth, opened the sepulchres, and rent the veil of the temple!’ Nothing of the kind said he to Pilate. When these things Joseph spake to Pilate on this wise, Pilate commanded that the all-holy body of Jesus be given him. And he went to the place called Golgotha and took God in the flesh down from the Cross and laid Him on the earth, naked God in the flesh, Him that was not merely a man. Lo, He is beheld lying low, Who drew all men on high. And He for a brief time is bereft of breath, Who is the Life and Breath of all. He is seen bereft of eyes, Who created the many-eyed beings. He lies prostrate, Who is the resurrection of all. And God is slain in the flesh, Who raised up the dead. The thunder of God the Word is now silent for an instant and He is borne in the arms of men, Who holds the earth in His hand. Dost thou really, O Joseph, know Whom thou was given when thou didst ask and receive? Dost thou truly know Whom thou didst carry when thou earnest to the Cross and didst bring down Jesus? If in truth thou knowest Whom thou didst carry, thou art now verily become rich. And how is it that thou givest burial to this most awesome body of God? Praiseworthy is thine ardour, but even more praiseworthy the disposition of thy soul. For dost thou not tremble, bearing in thine arms Him before Whom the Cherubim tremble? With what fear dost thou strip that Divine flesh of the loin cloth? And how dost thou reverently restrain thine eye? Art thou not fearful when gazing upon and shrouding the nature of God's flesh, He that surpasses nature? Tell me, O Joseph, dost thou really bury towards the East a dead man that is the Dayspring of the East? And with thy fingers dost thou close the eyes of Jesus as befits the dead, nay, of Him that with His immaculate finger opened the eyes of the blind? And dost thou bind the mouth of Him that opened the mouth of the stammerer? Dost thou lay out with thy hands Him that extended the withered hands? Or dost thou bind the feet, as befits the dead, of Him that made motionless feet to walk? Dost thou place upon a bed Him that commanded the paralytic, 'Take up thy bed and walk'? Dost thou empty out myrrh upon the celestial Myrrh Who emptied Himself and sanctified the world? Dost thou dare to wipe that Divine side of Jesus bleeding still, the side of God Who healed the woman of an issue of blood? Dost thou wash with water God's body which cleanses all and bestows purification? But what lamps dost thou light for the 'true Light which enlighteneth every man'? What funeral odes dost thou chant for Him that is hymned unceasingly by all the Heavenly hosts? And dost thou weep as though He were dead that wept and raised up Lazarus, the four days dead? And dost thou bewail Him that gave joy to all and banished the sorrow of Eve? And so chanting sacred hymns, Saint Joseph buried the holy Body of our Saviour. 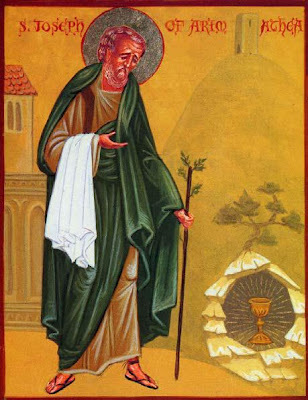 Because of the Passover there was no time to prepare a tomb for our Lord, so Saint Joseph placed our Lord's body in his own new tomb, which he had hewn out in the rock. (Mt.27:60). The Jews, enraged by Saint Joseph's action, threw him into a deep pit and left him to die. Through the Grace of God, he was taken up from this place and brought to Arimathea. After the Resurrection, our Lord appeared to him and revealed to him the mystery of His Resurrection. It was after Christ's ascension that Saint Joseph gave up all fear and boldly confessed his faith in our Lord. Even though his former friends and loved ones opposed him, he could not bear to keep silent and openly preached the mystery of the Resurrection. Finally, he was driven from his home, but he was not grieved. Instead, he took this as a sign that he should travel and enlighten those who had never heard the Holy Faith. The Holy Apostle Philip sent him with twelve followers to the Isles of Briton. All the limits of the Spains, and the diverse nations of the Gauls, and the haunts of the Britons--inaccessible to the Romans, but subjugated to Christ. Hippolytus (AD 170-236), considered to have been one of the most learned Christian historians, identifies the seventy whom Jesus sent in the Gospel of Saint Luke, and includes Saint Aristobulus listed in Romans 16:10 with Saint Joseph and states that he ended up becoming a Shepherd in Britain. The Apostles passed beyond the ocean to the isles called the Britannic Isles. The British Isles which are beyond the sea, and which lie in the ocean, have received virtue of the Word. Churches are there found and altars erected ... Though thou shouldst go to the ocean, to the British Isles, there though shouldst hear all men everywhere discoursing matters out of the scriptures, with another voice indeed, but not another faith, with a different tongue, but the same judgment. Traveling across the perilous marshes of Somerset, the thirteen holy companions crossed the water to Glastonbury, coming at last to a hill which tradition still shows today, called Weary-All. As was the custom, the saint carried a pastoral staff of dry hawthorn. When he stopped to rest, he stuck the staff into the ground where it blossomed as a sign of God's favour. The miraculous staff soon grew into a great tree, which continues to blossom to this day during Holy Nativity. In fact, official records show that after England adopted the Gregorian Calendar the Glastonbury Thorn continued to blossom on the Church Calendar date for Nativity. Here at Weary-All Hill the saint's party was met by a local chieftain, Arviragus, who, being impressed by the piety, gentleness, and meekness of Saint Joseph, donated twelve 'hides' of land to the group (approximately 160 acres). Here, on the Twelve Hides of Glastonbury, our holy patron sank the firm roots of Orthodox Christianity, building a church which he dedicated to the Most Holy Theotokos. St. Joseph and his companions enlightened many of the Tritons and baptized large numbers of them into the Holy Church. It was here that Saint Joseph of Arimathea, gave up his soul into the hands of our Saviour. Much later in 183 A.D. another group of missionaries came to the holy site where Saint Joseph had reposed, and there occurred many miraculous deeds and mysteries of healings. Christians lived at this site as hermits until the fifth century when our holy father among the saints, Patrick of Ireland, visited Glastonbury and formed a monastery on the site. Shortly after this St. David of Wales also visited this venerable place and began the building of a larger Church on the site. Glastonbury became a great place of pilgrimage for the Orthodox people of Britain. Many other saints came and dwelt on the lands where the Holy Apostolic Faith was first preached to the natives of Britain, the lands of Glastonbury, sanctified by Saint Joseph. Glory to God for all things." Let us honour the man that gave burial to God and showed compassion to Him by Whose mercy all things exist: Christ the Angel of Great Counsel’s Noble Counselor: who gave his narrow grave to Christ and received as recompense the vast spaciousness of Heaven, where he entreateth the Saviour to show His mercy to those praising him. For Part I covering the spirituality and DIVINE eros of the Song of Songs, along with a passage on the Resurrection, see: http://full-of-grace-and-truth.blogspot.com/2010/04/patristic-commentary-on-song-of-solomon.html. "By night on my bed I sought him whom my soul loveth: I sought him, but I found him not. It was but a little that I passed from them, but I found him whom my soul loveth: I held him, and would not let him go, until I had brought him into my mother's house, and into the chamber of her that conceived me." 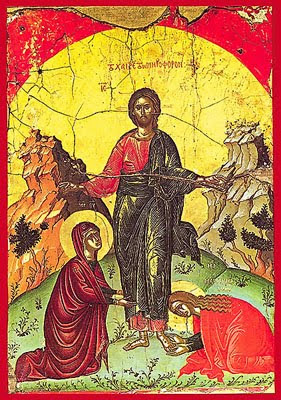 "And because we see the heavenly mysteries represented allegorically on earth through the gospel, let us come to Mary Magdalene and to the other Mary. Let us meditate upon how they sought Christ at night in the bed of his body, in which he lay dead, when the angel said to them, "You seek Jesus, who was crucified. He is not here, for he has risen. Why then do you seek in the tomb him who is now in heaven? Why do you seek in the bonds of the tomb him who frees all men of their bonds? The tomb is not his dwelling, but heaven is. And so one of them says, 'I sought him and I did not find him'." -St. Ambrose of Milan, "On Isaac, of the Soul"
"'In my chamber by night I sought him." This refers to the women who came at the beginning of the morning on the sabbath to the tomb of Jesus and did not find him. He is in the chamber, therefore, or away from the chamber. Or perhaps they call their chamber the Lord's tomb because we are buried together with him. But when they did not find him, they heard at once: 'He is not here, for he has been raised.' And they discovered guardian angels, whom they asked, 'Where have you laid the Lord?' Then, when they had left the angels whom they were questioning, the Lord met them and said, 'Rejoice.' For this reason, it says, 'When I had passed by them for a little while, I found him whom I will not let go.' She grasped his feet and heard, 'Don't hold me.' Finally, he called the gathering of the apostles the house of the mother, to whom he announced the resurrection of Christ. -St. Cyril of Alexandria, "Fragments in the Commentary on the Song of Songs"
"Let us follow him by day, the present day of the church, which Abraham saw and was glad. This is why we follow Christ during the day; for he will not be found by night. 'Upon my bed,' Scripture says, 'by night I sought him whom my soul loves. I called him, but he gave no answer.'" -St. Ambrose of Milan, "On Virginity"
"We seek the one we love upon our beds when we sigh with longing for our Redeemer during our short period of rest during the present life. We seek him during the night, because even though our hearts are already watchful for him, our eyes are still darkened. But it remains for the person who does not find the one he loves to rise and go about the city, that is, he must travel about the holy church of the elect with an inquiring heart. He must seek her through its streets and squares, making his way, that is, through narrow and broad places, on the watch to make inquiries if any traces of her can be found in them, because there are some, even of those leading worldly lives, who have something worth imitating of virtue in their actions. The watchment who guard the city find us as we search, because the holy fathers who guard the church's orthodoxy come to meet our good efforts, to teach us, by their words of their writings. Scarcely have we passed them by when we find him whom we love. Although in his humility our Redeemer was a human being in the midst of human beings, in his divinity he was above human beings. Therefore once the watchmen have been passed by, the beloved is found." -St. Gregory Dialogos, "Forty Gospel Homilies 25"
"Happy the person in whose heart Jesus sets his feet every day! If only he would set his feet in my heart! If only his footsteps would cling to my heart forever! If only I may say with the spouse, 'I took hold of him and would not let him go.'" -St. Jerome, "Homilies on the Psalms 26"
St. Athenogenes the Martyr, and "O joyful Light..."
"It seemed fitting to our fathers not to receive the gift of the light at eventide in silence, but, on its appearing, immediately to give thanks. Who was the author of these words of thanksgiving at the lighting of the lamps, we are not able to say. The people, however, utter the ancient form, and no one has ever reckoned guilty of impiety those who say We praise Father, Son, and [Holy Spirit, God]. And if any one knows the Hymn of Athenogenes, which, as he was hurrying on to his perfecting by fire, he left as a kind of farewell gift to his friends, he knows the mind of the martyrs as to the Spirit. On this head I shall say no more." O joyful Light of the holy glory of the immortal, heavenly, holy, blessed Father, O Jesus Christ. Now that we have come to the setting of the sun and see the evening light, we sing the praise of God, Father, Son and Holy Spirit. It is right at all times to hymn you with holy voices, Son of God, giver of life. Therefore the world glorifies you. "Procopius was born in Jerusalem of a father who was a Christian and a mother who was a pagan. At first, his name was Neanias. Following the death of his father, the mother raised her son completely in the spirit of Roman idolatry. When Neanias matured, Emperor Diocletian saw him and, at once, took a liking to him and brought him to his palace for military service. When this nefarious emperor began to persecute Christians, he ordered Neanias to go to Alexandria with a garrison of soldiers and there to exterminate the Christians. But, on the road, something happened to Neanias similar to that which happened to Saul [Paul]. In the third hour of the night there was a strong earthquake and, at that moment, the Lord appeared to him and a voice was heard: "Neanias, where are you going and against whom are you rising up?" In great fear, Neanias asked: "Who are You Lord? I am unable to recognize You." At that moment, a glowing cross as if of crystal appeared in the air and from the cross there came a voice saying: "I am Jesus, the crucified Son of God." And further, the Lord said to him: "By this sign that you saw, conquer your enemies and My peace will be with you." That experience completely turned him around and changed the life of Commander Neanias. He issued an order to make the same kind of cross which he saw and instead of going against the Christians he, with his soldiers, turned against the Agarians who were attacking Jerusalem. He entered Jerusalem as a victor and declared to his mother that he is a Christian. 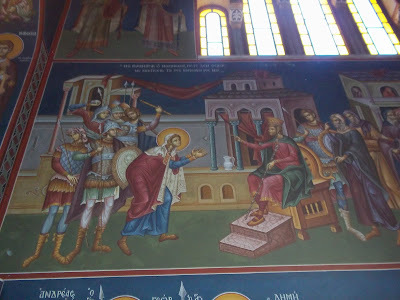 Being brought before the court, Neanias removed his commander's belt and sword and tossed them before the judge thereby showing that he is only a soldier of Christ the King. After great tortures he was cast into prison where the Lord Christ, again, appeared to him, baptized him and gave him the name Procopius. One day twelve women appeared before his prison window and said to him: "We too are the servants of Christ." 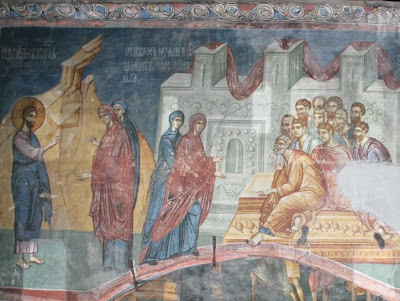 Accused of this they were thrown into the same prison where St. Procopius taught them the Faith of Christ and particularly about how they will receive the martyr's wreath. For that reason in the marriage ritual of the betrothed, St. Procopius is mentioned along with the God-crowned Emperor Constantine and Empress Helena. After this, those twelve women were brutally tortured. Witnessing their suffering and bravery, the mother of Procopius also believed in Christ and all thirteen were slain. When St. Procopius was led to the scaffold, he raised his hands toward the east and prayed to God for all the poor and misfortunate, orphans and widows and especially for the Holy Church that it may grow and spread and that Orthodoxy shine to the end of time. And to Procopius there was a reply from heaven that his prayers were heard after which he joyfully laid his head under the sword and went to his Lord in eternal joy. 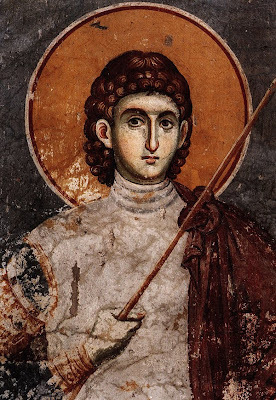 St. Procopius honorably suffered in Caesarea in Palestine and was crowned with the glorious wreath of immortality on July 8, 303 A.D."
Pagans, zealots for the Faith. As a Christian, to his mother came. To the heavenly King, a servant became. For today as one time, he helps. 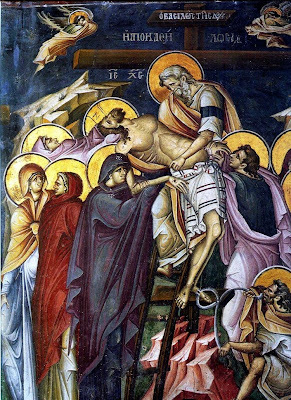 In his suffering, O Lord,/ Thy martyr Procopius received an imperishable crown from Thee our God;/ for, possessed of Thy might,/ he set at nought the tormentors and crushed the feeble audacity of the demons.// By his supplications save Thou our souls. 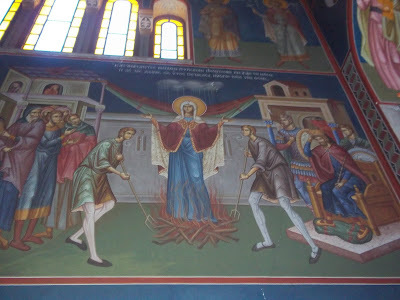 Kontakion, Tone II, ''Seeking the highest..."
Set afire by divine zeal for Christ,/ and protected by the might of the Cross, O Procopius,/ thou didst cast down the audacity and boldness of the foe,/ and didst raise up an honorable church,// excelling in faith and enlightening us. 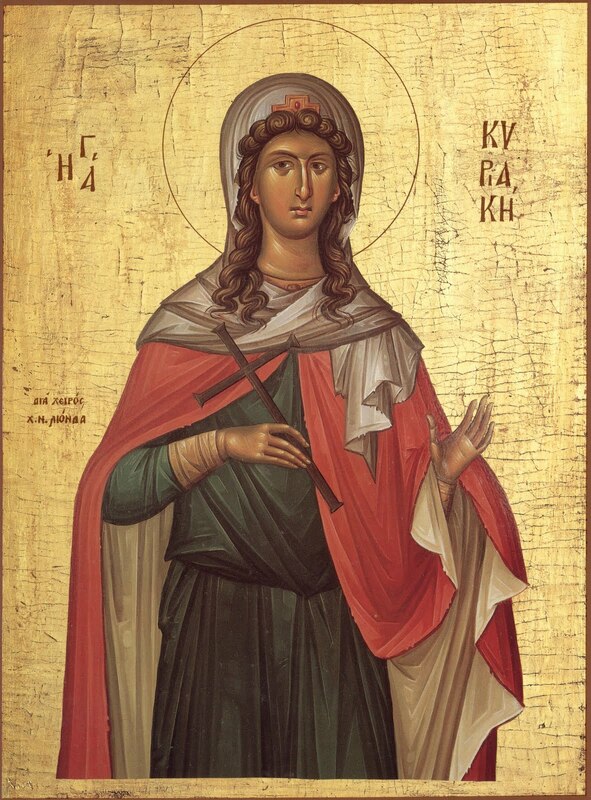 You were lead towards heavenly piety, and rejoiced to follow Christ, as Paul, O boast of Martyrs, Prokopios. Therefore by the power of the Cross, you were perfected excellently, and deposed Belial. Save those who praise you with fervor from his evil, unscathed. 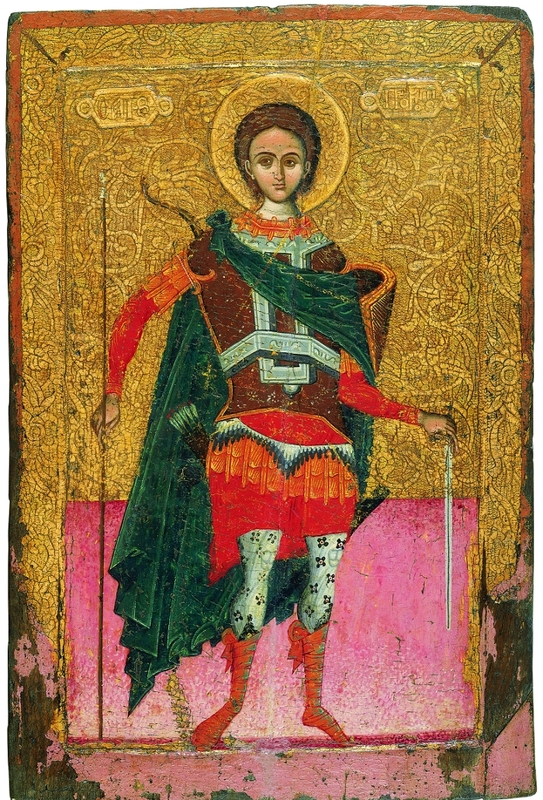 The full service and Paraklesis of the Saint in Greek are available here: http://voutsinasilias.blogspot.com/2009/06/8-1.html, http://voutsinasilias.blogspot.com/2009/06/8-2.html. "Saint Kyriake was the only child of Dorotheus and Eusebia. Since she was born on a Sunday (Kyriake, in Greek), she was named Kyriake. The magistrate was angered by her words, so he went to the emperor Diocletian to denounce the saint and her parents as Christians who mocked the idols, and refused to offer sacrifice to them. Diocletian sent soldiers to arrest the family and have them brought before him. He asked them why they would not honor the gods which he himself honored. They told him that these were false gods, and that Christ was the one true God. Dorotheus was beaten until the soldiers grew tired and were unable to continue. 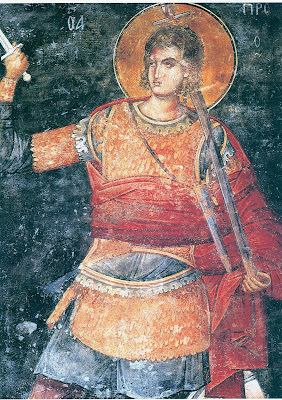 Since neither flattery nor torment had any effect, Diocletian sent Dorotheus and Eusebia to Melitene on the eastern border between Cappadocia and Armenia. Then he sent St Kyriake to be interrogated by his son-in-law and co-ruler Maximian at Nicomedia. Maximian urged her not to throw her life away, promising her wealth and marriage to one of Diocletian's relatives if she would worship the pagan gods. 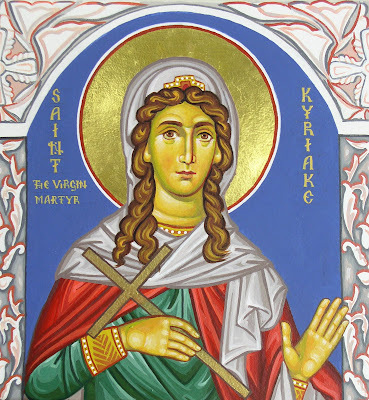 St Kyriake replied that she would never renounce Christ, nor did she desire worldly riches. Enraged by her bold answer, Maximian had her flogged. The soldiers who administered this punishment became tired, and had to be replaced three times. Shamed by his failure to overcome a young woman, Maximian sent St Kyriake to Hilarion, the eparch of Bithynia, at Chalcedon. He told Hilarion to either convert Kyriake to paganism, or send her back to him. Making the same promises and threats that Diocletian and Maximian had made before, Hilarion was no more successful than they were. St Kyriake challenged him to do his worst, because Christ would help her to triumph. The saint was suspended by her hair for several hours, while soldiers burned her body with torches. Not only did she endure all this, she also seemed to become more courageous under torture. Finally, she was taken down and put into a prison cell. That night Christ appeared to her and healed her wounds. When Hilarion saw her the next day, he declared that she had been healed by the gods because they pitied her. Then Hilarion urged her to go to the temple to give thanks to the gods. She told him that she had been healed by Christ, but agreed to go to the temple. The eparch rejoiced, thinking that he had defeated her. In the temple, St Kyriake prayed that God would destroy the soulless idols. Suddenly, there was a great earthquake which toppled the idols, shattering them to pieces. Everyone fled the temple in fear, leaving Hilarion behind. Instead of recognizing the power of Christ, the eparch blasphemed the true God as the destroyer of his pagan gods. He was struck by a bolt of lightning and died on the spot. 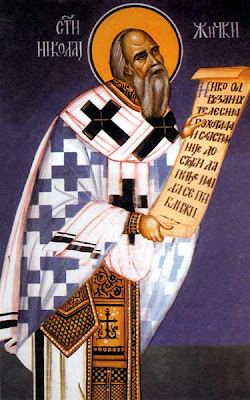 St Kyriake was tortured again by Apollonius, who succeeded Hilarion as eparch. When she was cast into a fire, the flames were extinguished. When she was thrown to wild beasts, they became tame and gentle. Therefore, Apollonius sentenced her to death by the sword. She was permitted time to pray, so she asked God to receive her soul, and to remember those who honored her martyrdom. Just as St Kyriake ended her prayer, angels took her soul before the soldiers could strike off her head. Pious Christians took her relics and buried them in a place of honor." Neither to be frightened by anything did allow. But sweet is the Name of Jesus! But sweet is eternal reigning! But the joy of Paradise is sweet! Wonderful candle, amidst the candles of Paradise. O virgin martyr Kyriake, you were a worthy sacrifice when you offered your pure soul to God; wherefore Christ has glorified you, and through you pours forth graces abundantly on all the faithful, for He is the merciful Loving God! 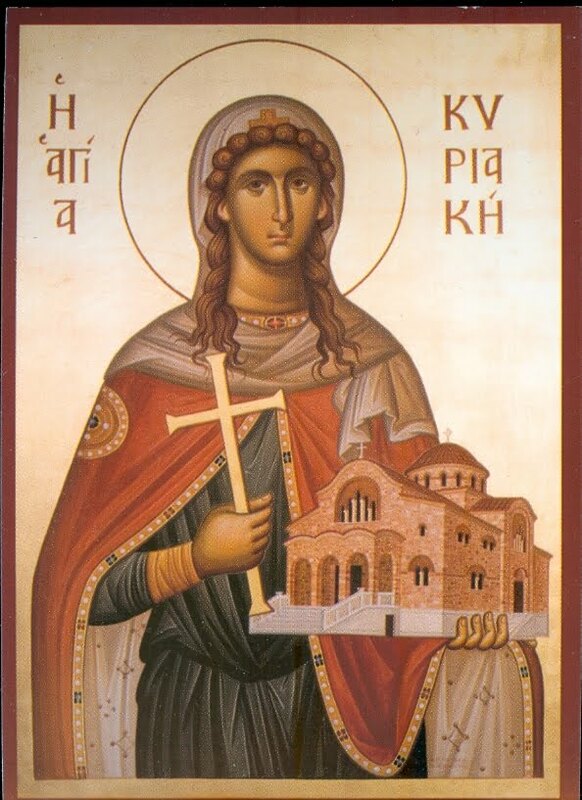 The Martyr of Christ hath called us all together now to praise and acclaim her wrestlings and her godly feats; for possessed of manliness of mind, she hath proved to be worthy of her name, being lady and mistress of her mind and the passions of unseemliness. Most strong Virgin, who placed her hope in God, you endured threats and fire, and painful bodily tortures, O Martyr, and you humbled your brave mind, because of this we bless you in faith and fervor. O most beautiful Bridegroom, fairest beauty, in your prepared soul, you preserved pure virginity, O Martyr, and received blows as a dowry, O most-praised Kyriake. 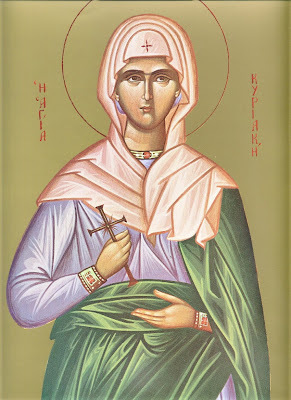 Your much-suffering body, buried in the earth, springs forth rivers of healings, to those who flee to you piously, and they receive the removal of passions and the cleansing of evil, and provision against the demons, O Kyriake, the bride of God. O virgin Kyriake, grant me deliverance from my sins by your prayers. Your all-holy memory, O martyr, has dawned like the sun for us, O Kyrake, dissipating the clouds of passions, and illumining all who truly honor you in faith, O virgin, and bless you with fervor. Magnify my soul, the spotless Mother of the King of all. We behold you as the most-radiant lamp of Him who was born of you, surpassing the mind, O Theotokos, and we are faithfully illumined, and delivered from passions, and all dangers and trials. Second Canon of the Saint. Angels, beholding the struggle of the Saint, were astonished, how a woman by nature, suffered such struggles. That we may faithfully, O all-renowned Martyr, praise and celebrate your true and worthy to be praised, and light-bearing glorious memory, grant to all, deliverance and mercy, and salvation of souls, O most-praised one. Angels and men honor the struggle of the Saint, and ceaselessly hymn Christ Who strengthened her. O Kyriake, the boast of Martyrs, and pride of virginity, O glorious one, enlighten the darkness of my nous from the attacks of him who ever wars against us, that I may noetically behold the illumination of the Holy Trinity, and praise you. All lovers of the feast of the Saint, now celebrate with fervor the struggle of Kyriake, decorated in hymns. 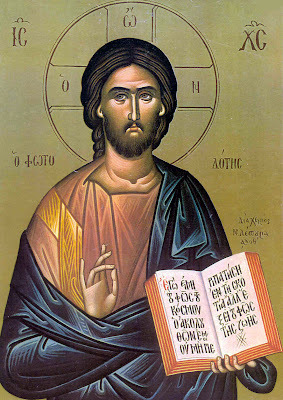 Protect us from above, O Kyriake, who celebrate your divine struggle, and preserve us unharmed, O glorious one, through your divine intercessions to the Creator, and grant us the remission of offenses, and mercy and salvation of souls. Today the heavenly ranks of Champions and Virgins rejoice and skip at the memory of Kyriake. Bestow grace now, O most-renowned one, on those who celebrate your revered and worthy to be praised memory with fervor, O renowned Kyriake, and also remission, through your intercessions, of sins, to those who ever praise you in faith. Angels hastening to receive your soul, O Champion, bring it to the Creator and your beloved, O virgin. I bring to mind, O pure one, the astonishing struggles and wrestlings and brave deeds that you endured, O glorious Virgin Martyr, suffering in the stadium for the love of Christ, for you were crowned with the dual crowns of virginity and martyrdom. All ye faithful, let us worship the Divine Trinity, Father, Son and divine Spirit, the tri-hypostatic rule. O Trinity: Father, Son and Comforter, the Holy Spirit, through the intercessions of the Champion Kyriake, O Lover of man, grant Your peace to Your Church, and strike down the pride of barbarians, and exalt the horn of Your people. 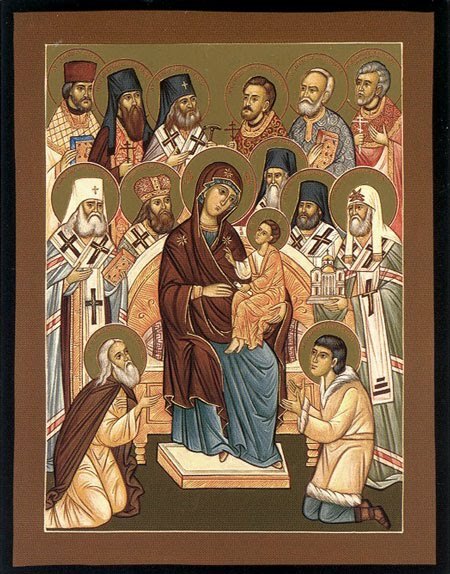 All ye faithful, let us praise the Theotokos in hymns, the all-holy virgin, and Mother of the Savior. Clothed in flesh from You, O All-pure One, the Logos took on a body, and became a citizen of this world, as merciful, [memenekos ouk ellaton] as formerly bodiless, and Who formerly deposed, through His divine power, him who tyrannizes all. The precious, wonderworking Skull of St. Kyriake the Great Martyr, brought from Constantinople to the Monastery of the Taxiarchs, Aigio (Greece) in the 15th century, where it is treasured to this day (http://2.bp.blogspot.com/-wBrhfwcrW6Y/ThSo2U8CcGI/AAAAAAAAIJI/KO8MZ3ZehpY/s1600/102_3316.JPG) Also see: http://full-of-grace-and-truth.blogspot.com/2008/12/st-leontios-righteous-of-monemvasia-and.html. "And he implemented practically the similar words of Paul “he serves in his serving…he leads with diligence” (Romans 12:7-8) and in a certain sense “hesychazon [engaging in hesychasm] in nepsis”. Because of this for us monks of the Holy Mountain, St. Athanasios, is not simply a Saint, among the so many, but he is exceptionally the spiritual Father of all. In his personality, in his paternal care and affection, in his illumined mind, in his discernment, each one of us finds, throughout all of the generations, that which is analogous, and can easily and seamlessly continue the path of blessed hope that is attained in the monastic life. Two things characterized this great light exceptionally. The one is utter philoponia, the continual taking-up of the cross, which is considered the most essential element, as the backbone of monastic education [αγωγής]. Among other things, the hesychastic regimen, which he continued from the beginning, before taking up his great responsibilities later. He was so won over by by the ascetical disposition which many presented that without it being his desire, he abandoned so many social concerns natural to the monastic idiom. He eagerly desired to be without cares, and to continue according to his desire, the monastic life alone, which many times he pursued in his cave, which is found outside of the southeast side of the Lavra, in the area known as Viglan. The second thing is the element of love, community and solidarity. Although he was to himself an austere ascetic and a most lover of pain, to others he was always caring and full of love. And his much love and affection, indeed has and continues to unite Athonite monasticism and we believe it will continue until the end of the world, from all that is shown by Divine Providence, amidst the unsleeping intercessions of this great luminary. Of course if we make use of this, let us write about it, let us acknowledge it. But least of all, like an unpayable debt we presented these, that each of us may wake ourselves up and imitate something from the many-varied, and many-myriads of his virtues. So was his provision of support to the flock that as he sat on the left site of the Holy Bema and even at the hour of the service, gave himself to confessing the brothers, not only of his monastery, but many others. In the all-free spirit of his fatherly affection, to give rest to all personalities and be pleasing to all characters, both to the most weak and most powerful, he did not neglect to use human knowledge, in the invention, to change and make a higher life, and that the most sick and weakest in character would boast in their monastery individuality, and not be discouraged. He created, within the breadth of his fatherly providence, a schedule, which up till then did not exist, but according to the tradition of the isolated way of monastic life on Athos, was perceived as reprehensible. He built ports, roads, warehouses, vineyards, gardens and anything else he could through instruments, through basic comforts for all people who would be able and would desire to become monks. But this created misunderstandings, and as is mentioned in his life, he is perceived as an “entrance for new demons”. He continued to be slandered and moved against by the administrative beginning of the Holy Mountain. They tried to judge him, for they they alleged that he violated the programs and way of hesychia of the Fathers. Then in reality, our Lady the Theotokos intervened personally and granted them hesychia, and strengthened him to continue and to not be fainthearted and abandon his work. In his of course trying difficulties, when economically he couldn't complete that incredible task which he began, then our Lady appeared to him, and gave him courage. Her promises were so alive, palpable and certain, that once, when there was nothing left in the warehouse or in the stores, She appeared herself and said “I will be the Oikonomos [Steward or Caretaker] of the Monastery from now on, that you might not have any cares.” And in reality, many times She gave Her blessing and all of the stores would fill with food, at a difficult time when many workers and the multitude of monks wouldn't have been enough. And from then on, this Most-Holy Monastery has never had an oikonomos, as in other Monastery systems, but a paraoikonomo [person beside the steward]. And one of her icons, which is in the storehouse and depicts the miracle, is called Oikonomissa; many miracles have occurred before this icon, and the monks give thanks with special reverence. Many times she appears to bless and increase the various material needs of the Monastery. This is, in a few words, that which I wanted to remind you of today, that which you know already. Furthermore, however, turn your care and reverence to this, for, though there are various and typical pious elders here, mysteriously for each and all of us, the great Elder and protector and abbot and spiritual father is our most-righteous father Athanasios, who is the continuer, the provider of this place, let alone all of eastern monasticism. Through his holy intercessions and that of our All-Pure Lady the Theotokos, Lord Jesus Christ God, have mercy on us and save us." "Let us now turn our gaze from the East to the far West, i.e., to America. These are the fundamentals upon which you can build your individual and communal happiness. And you have received these fundamentals as a glorious heritage, never to part with. By practicing this spiritual heritage in your daily life, you will become an adornment to America. And through you all Americans will come to know and appreciate our ancient Church of the East and her spiritual heroes, whom we are praising today." I. In 1911 a pious and very rich Russian man (who had the desire to become a monk) visited Megiste Lavra Monastery, which as is known celebrates on July 5th in the memory of its founder, St. Athanasios the Athonite. There he was observed by a monk to be worried, and after a conversation, this rich man said that he was totally bald and beardless, and was thus embarrassed in front of everyone. The monk told him to anoint his head with oil from the vigil lamp of the Saint. The Russian man did this, and gave some small gifts, and in a short time, he grew hair and a beard. He gave gifts to the Monastery and of course became a monk with the name Athanasios at Megiste Lavra. II. In 1965 a boat was traveling between Thasos and Kavala when a terrible storm and darkness struck. As the sailors were struggling with the waves, one of them remembered that they were somewhere across from Megiste Lavra Monastery. Then he cried from his soul: “Saint Athanasios, save us!” and instantaneously the boat was found safe in peaceful waters, in the port below the Monastery. The sailors, astonished by that which they experienced and seen, ascended to the Monastery, and stayed for a few days there, thanking St. Athanasios for their salvation beyond all hopes. III. 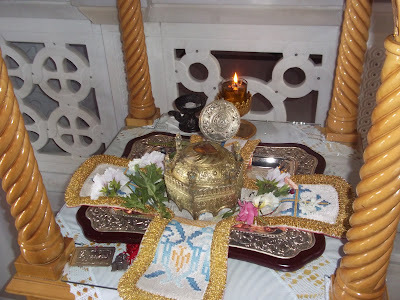 In 1981 when the Monastery turned to a coenobium from being idiorhythmic, at the vespers of the vigil for St. Athanasios (July 4th into the 5th), an indescribable aroma arose from his tomb for a while, the fact of which was interpreted as joy and satisfaction of the Saint for this change. IV. In 1984, again during the vespers of the vigil in memory of St. Athanasios, a monk saw with his own eyes, the Saint come from his tomb bodily and as if he were alive, and he was totally astonished. V. Nikolaos Zachariades, in one of his books on the Holy Mountain, writes that once during the 1980's, he was at the vigil of St. Athanasios at Megiste Lavra. Straightaway from the tomb an indescribable fragrance arose, to the astonishment of all. In fact, from this fragrance, even the clothes of all those who were present smelled, as the author himself relates. This fragrance of their clothes remained for many years (through the year 2000) though they were washed many times (with cleaners with different smells). The aroma remained and was distinguished from other aromas.